Last week we got a small (like 1 day small) taste of Fall weather. But this weekend it was back to warm temps and I was back to straddling one foot on Fall and one foot on Summer, which was totes cool with me. I could honestly live in big cozy knits and comfy shorts! Things have been so busy as of late, that this has become my go to uniform. Dude. I wore cashmere and shorts this weekend. I was all kinds of confused. Now it's supposed to be 80 degrees this week. Help! I need more sweaters...you've got me on the bandwagon. That is one fabulous uni! That chain link necklace is so gorg! the hat makes the entire outfit even more fabulous! Love the long gold chain - i'm on the lookout for one in silver. The striped sweater is absolutely darling. The weather was a bit crazy here too, I loved it, but in the morning and evenings, it was chilly but then during the day it was getting a bit warm. A sweater and a pair of shorts would have been the perfect outfit. I love the colors & cut of this big cozy knit & the necklace is GORGEOUS! Lovely, lovely! xo. Those shoes are doing it for me! Love the sweater but LOVE those shoes!! That sweater is amazeee-inggg... love the colors... goes so well with those rad OC boots and that vintage Gucci. P.S. I have the same vintage Gucci, but in blue!! I love the idea of a chunky sweater paired with shorts - genius! love this outfit love the colors! The hat makes the look! I kind of hate that so much of decision making process in the morning depends on the weather. Still trying to stock up on some essentials for fall though. Do you have any suggestions on where to find pretty fall boots? you always have the nicest necklaces! so gorgeous! Same here!!! it was in the 80's! I love that sweater!!!! OH my word- how PERFECT is that sweater?! Thanks for your comment! Your looks is great too! I love the shoes you're wearing! ah this sweater and necklace - im in love! and i, like you, kinda love straddling the summer/fall weather. something about shorts with cozy tops gets me every time! We really love the booties and vintage Gucci! Adorable! I love that sweater! Did you purchase it recently? Cozy and chic! You always look awesome. Love an off the shoulder shirt! your outfit is absolutely adorable!! i love the stripes and shoes the best!! i love the sweater; the weather here in Maryland has been so up and down! lol. 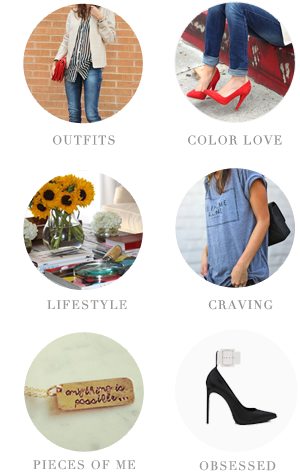 You may actually have one of my favorite fashion blog of EVER!! You look amazing in this. You really know what works for you. The sweater is gorgeous. Loving this fall outfit! The colours are great. Nothing like wearing shorts in the middle of October eh? LOVE that hat...I need a wide brimmed fall/winter hat..it has been decided. Also ADORE the bootie sandal hybrid...all sorts of fabulous. Your outfit rocks. Shoes are Epic! I adore the Chicness of this casual outfit. i love this outfit. you look really beautiful! You and your hats... I wish I could pull that off. I agree! The combo of knitwear (more covered) and then shorts (much less so) is one of my favorites. But then again, I love playing with a juxtaposition of fun clothes. wow nic eoutfit!! I am totally into hats right now and love yours!! Where are your shoes from? And where are you from? Nice blog girl!! I am so in love with red and beige.